Tired of wasting your money on electric heat? Then you should think about installing a furnace. When you want the most efficient heating at the lowest price, a furnace is your best option. Electricity costs have steadily risen for years. Natural gas costs, by comparison, have remained much lower and more consistent. Why Not Get a Heat Pump? Unlike heat pumps, furnaces make their own heat. They do this by burning natural gas with a small flame. Furnaces are much more dependable in the winter; you never need to worry if it’s too cold to get heat from the air. What’s more, furnaces last anywhere from 50-75% longer than heat pumps when both are properly maintained. Steve’s Heating handles the distribution and installation of Trane furnaces. 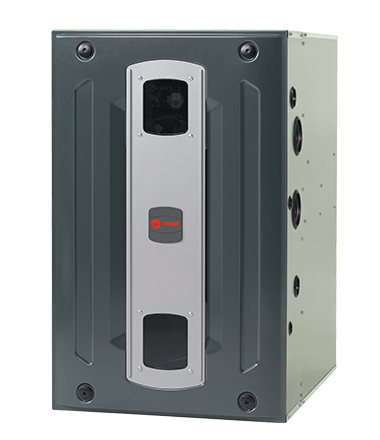 The Trane S9V2 a part of Trane’s cutting edge S-series, a group of furnaces that were redesigned from the ground up to deliver state-of-the-art heating along with the same Trane quality you’ve come to expect. The new S-series furnace cabinets are designed to fit perfectly in any home. Plus, they are certified to be airtight up to 1%, so you’re not wasting money on leaky air. The S9V2 is rated at 96% gas efficiency, and its blower is one of the most efficient (and quiet) in the industry. A combination of stainless steel primary heat exchanges and a brand-new blower makes the S9V2 one of our most efficient furnaces ever. Steve’s Heating and Cooling has been servicing heating and cooling systems in Northern Kentucky since 1975. We service all major brands and most types of systems. Contact us today for a no-cost, in-home consultation by calling (859)795-2172 or emailing manager@stevesheating.com. We offer financing with credit approval on all products through Wells Fargo.